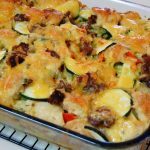 A savory bread pudding layered with sausage, zucchini, bell pepper, green onion and cheddar cheese. Serve our breakfast casserole with fresh fruit and a pitcher of mimosas! Preheat oven to 350 degrees. Beat eggs, milk and seasonings in large bowl with wire whisk until well blended. Add bread cubes; stir gently until evenly coated. Gently stir in cooked sausage, 1½ cups cheese and vegetables (do not over-stir or it will turn to mush). 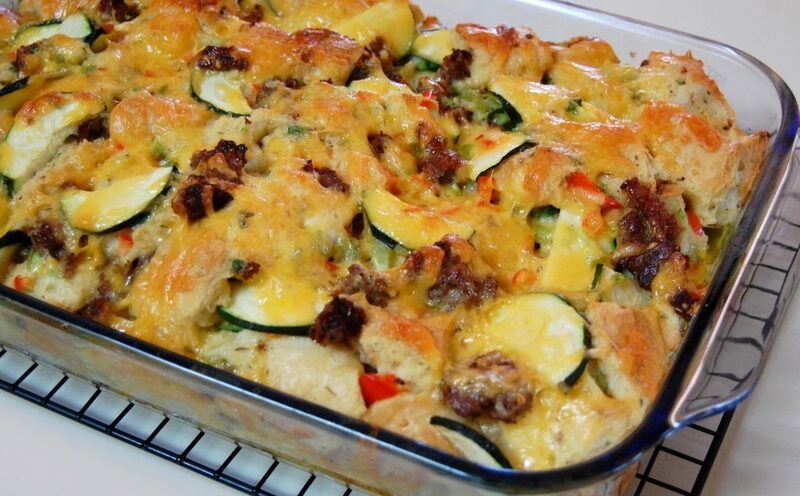 Pour into a lightly greased 13x9-inch baking dish; sprinkle with remaining cheese. Bake 45-50 minutes or until knife inserted in center comes out clean. Let stand 10 minutes before cutting into 12 squares to serve. Cook’s Note: Prepare using 1 pkg. Jimmy Dean Regular Flavor, Sage Flavor or Hot Pork Sausage Roll in place of Italian Flavored Sausage Roll, if desired.